Mix and prepare two pie crust for a 10" glass pie pan. Refrigerate dough disks in plastic wrap. In a small bowl mix the flour, sugar, cinnamon and nutmeg thoroughly. Set aside. Fill a large bowl with cold water and squeeze lemon juice of the lemon into the water. This will prevent the apples from turning brown. Peel the apples, leave whole and place each apple in the lemon water until all apples are peeled. Remove all whole apples from the water and begin to SPRIRALIZED each apple placing each curled apple BACK into the lemon water. Do this with all the apples leaving them in the lemon water until all apples have been SPIRALIZED. Remove SPIRALIZED apples from the water. Dry thoroughly with a kitchen towel or paper towels. OR, place apples in a salad spinner and remove as much water from the apples as possible, (moisture removed from the apples will give a taller pie). Place dried apples back in a large dry bowl and add the sugar mixture. Toss to fully incorporate. Spoon sweetened apples into pasty-lined glass pie plate. Dot apples with butter. Cover apples with second pastry top. Crimp dough edges to completely seal the bottom and top crusts. Make 3-4 slits into the top of the pie for hot air ventilation. Brush lightly with egg wash (1 small egg and 1 teaspoon of milk or just milk alone). Dust with sugar. Cover pie with foil and place on a cookie sheet. Bake at 425 degrees for 40 minutes. Remove foil and bake for another 20 minutes. 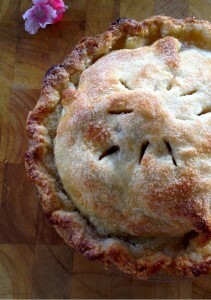 Check pie filling by Inserting a paring knife in the center to check for softened apples. Knife should easily go through the apple with only a slight resistance. Bake until apples are JUST soften. Remove pie from oven and allow to cool for 2 hours or overnight for best filling results. Cutting into a pie when hot or very warm will not allow the filling to set and will yield a runny filling. Enjoy your Granny Smith apple pie. Granny Smith and Pippin apples are not recommended at high-altitudes as they are dense apples and will not cook down fast enough before the pie crust begins to burn. But reducing the size of the apples very quickly and easily with the Paderno Spiralizer, the traditionally tart, but sweet taste of the Granny Smith or Pippin apple can once again be made and enjoyed by Mile-High dwellers! After 4 years, I have finally found a way to make America's favorite pie at high-altitude with Granny Smith or Pippin apples. It's probable safe to say, that most of America uses these apples for pie making as they hold up in high temperatures. Mom always used these apples and she has perfected her apple pie with them. But knowing the challenges of dense apples and the extra steps to cooking them down before placing them into the pie crust at high-altitude, I no longer had the desire to make one of my favorite pies at home. But discovering the Padermo Spiralizer I was able to easily and quickly reduce the size of these dense apples allowing the apples to bake to a soft consistency without the crust burning! The comforting taste of mom's home made apple pie with its slightly tart sweetness brought me right into her kitchen. Mom's apple pie recipe is back into my baking repertoire! Step 2 Mix and prepare two pie crust for a 10" glass pie pan. Refrigerate dough disks in plastic wrap. Step 3 In a small bowl mix the flour, sugar, cinnamon and nutmeg thoroughly. Set aside. Step 4 Fill a large bowl with cold water and squeeze lemon juice of the lemon into the water. This will prevent the apples from turning brown. Step 5 Peel the apples, leave whole and place each apple in the lemon water until all apples are peeled. Step 6 Remove all whole apples from the water and begin to SPRIRALIZED each apple placing each curled apple BACK into the lemon water. Do this with all the apples leaving them in the lemon water until all apples have been SPIRALIZED. 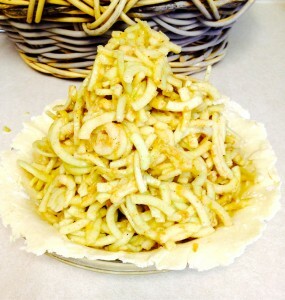 Step 7 Remove SPIRALIZED apples from the water. Dry thoroughly with a kitchen towel or paper towels. OR, place apples in a salad spinner and remove as much water from the apples as possible, (moisture removed from the apples will give a taller pie). Step 8 Place dried apples back in a large dry bowl and add the sugar mixture. Toss to fully incorporate. Step 10 Brush lightly with egg wash (1 small egg and 1 teaspoon of milk or just milk alone). Dust with sugar. Step 11 Cover pie with foil and place on a cookie sheet. Bake at 425 degrees for 40 minutes. Step 12 Remove foil and bake for another 20 minutes. 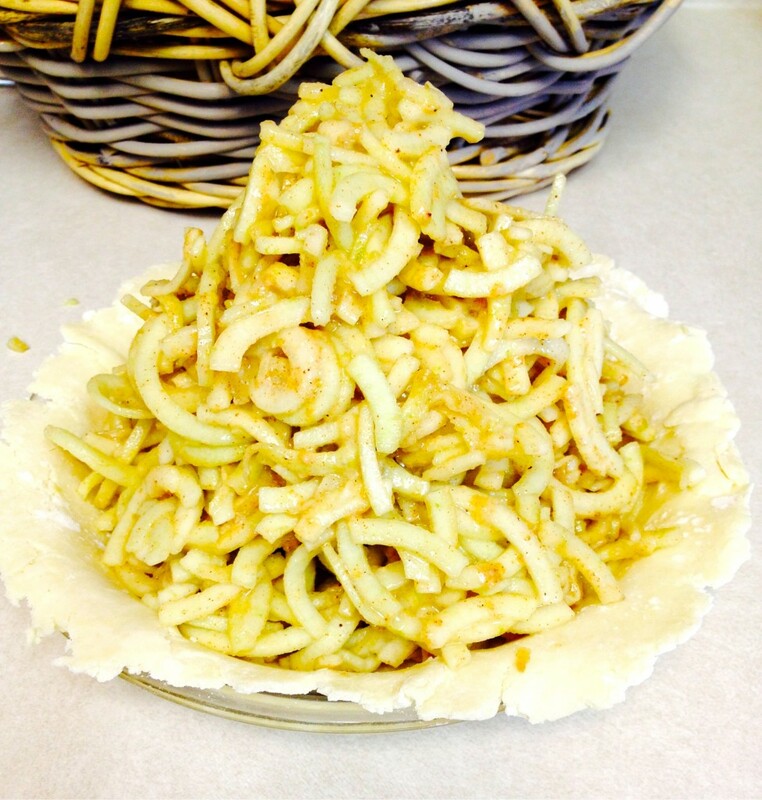 Check pie filling by Inserting a paring knife in the center to check for softened apples. Knife should easily go through the apple with only a slight resistance. Bake until apples are JUST soften. Step 13 Remove pie from oven and allow to cool for 2 hours or overnight for best filling results. Cutting into a pie when hot or very warm will not allow the filling to set and will yield a runny filling. Step 14 Enjoy your Granny Smith apple pie.